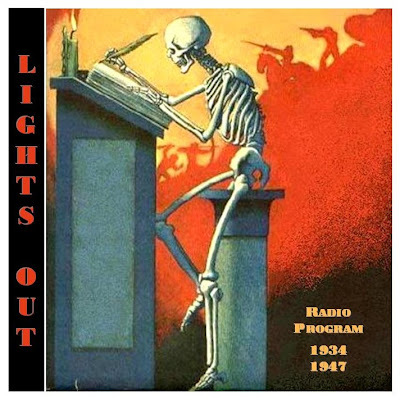 Lights Out is an extremely popular American old-time radio program, an early example of a network series devoted mostly to horror and the supernatural, predating Suspense and Inner Sanctum. 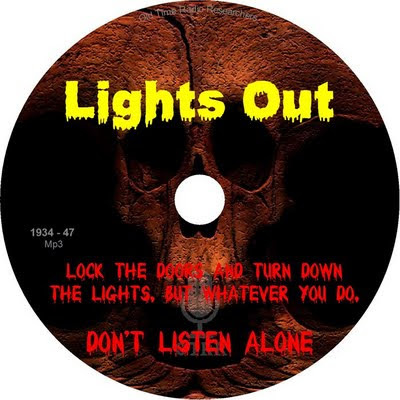 Versions of Lights Out aired on different networks, at various times, from January 1934 to the summer of 1947 and the series eventually made the transition to television. Cooper's run was characterized by grisly stories spiked with dark, tongue-in-cheek humor, a sort of radio Grand Guignol. A character might be buried or eaten or skinned alive, vaporized in a ladle of white-hot steel, absorbed by a giant slurping amoeba, have his arm torn off by a robot, or forced to endure torture, beating or decapitation -- always with the appropriate blood-curdling acting and sound effects. Adhesive tape, stuck together and pulled apart, simulated the sound of a man's or woman's skin being ripped off. Pulling the leg off a frozen chicken gave the illusion of an arm being torn out of its socket. A raw egg dropped on a plate stood in for an eye being gouged; poured corn syrup for flowing blood; cleavered cabbages and cantaloupes for beheadings; snapped pencils and spareribs for broken fingers and bones. The sound of a hand crushed? A lemon, laid on an anvil, smashed with a hammer. Though there had been efforts at horror on radio previously (notably The Witch's Tale), there does not seem to have been anything quite as explicit or outrageous as this on a regular basis. When the series switched to the national network, a decision was made to tone down the gore and emphasize tamer fantasy and ghost stories. There are no known recordings from Cooper's 1934-1936 run, but his less gruesome scripts were occasionally rebroadcast. An interesting example is his "Three Men", which had aired on Christmas 1935, was performed again on the series in 1937 (a version circulates among collectors under titles like "Uninhabited" or "Christmas Story"), and was revived for a 1948 episode of NBC's prestigious "Radio City Playhouse" anthology series. The plot is typical of Cooper's gentler fantasies. On the first Christmas after World War I, three Allied officers meet by chance in a train compartment and find one another vaguely familiar. They fall asleep and share a dream in which they are the Three Wise Men searching for Jesus. But is it really a dream? In the best tradition of supernatural twist endings, Cooper has the officers wake to find a strange odor in their compartment -- which turns out to be myrrh and frankincense. In the mid-1940s, Cooper's decade-old scripts were used for three brief summertime revivals of Lights Out. 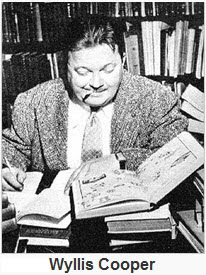 The surviving recordings reveal that Cooper was experimenting with both stream of consciousness and first person narration a few years before these techniques were popularized in American radio drama by, among others, Arch Oboler and Orson Welles. In one tale, a murderer describes how the Chicago police try to beat a confession out of him. When that doesn't work, they put him in a jail cell haunted by the ghost of a previous occupant, a smooth gangster named Skeeter Dempsey who describes his own execution and discusses the afterlife knowledgably. In the final twist, the narrator reveals that he has taken Skeeter's advice to commit suicide and is now, himself, a ghost. Another story, originally broadcast in March 1935 as "After Five O'Clock" and revived in 1945 as "Man in the Middle", allows us to follow the thoughts of a businessman as he spends a day at the office cheating on his wife with his secretary. The amusing contrast between what the protagonist thinks to himself and what he says out loud to the other characters enlivens one of Cooper's favorite plot devices, the love triangle. Other Cooper scripts are more routine, perhaps in part because the author's attention was divided by other projects. From the summer of 1933 until August 1935, Cooper was NBC Chicago's continuity chief, supervising a staff of writers and editing their scripts. He resigned in order to devote more time to Lights Out as well as a daily aviation adventure serial, Flying Time. At various times, he also served on NBC's Program Planning Board, wrote soap operas like Betty and Bob and commuted weekly to produce another program in Des Moines, Iowa. From early 1934 to mid-1936, Cooper produced close to 120 scripts for Lights Out. Some episode titles (all from 1935) include "The Mine of Lost Skulls", "Sepulzeda's Revenge", "Three Lights From a Match", "Play Without a Name" and "Lost in the Catacombs" (about a honeymoon couple in Rome who lose their way in the catacombs under the city). When Cooper departed, his replacement -- a young, eccentric and ambitious Arch Oboler -- picked up where he left off, often following Cooper's general example but investing the scripts with his own concerns. Oboler made imaginative use of stream of consciousness narration and sometimes introduced social and political themes that reflected his commitment to anti-fascist liberalism. Although in later years Lights Out would be closely associated with Oboler, he was always quick to credit Cooper as the series' creator and spoke highly of the older author, calling him "the unsung pioneer of radio dramatic techniques" and the first person Oboler knew of who understood that radio drama could be an art form. In 1946, NBC brought Lights Out to TV in a series of four specials, broadcast live and produced by Fred Coe, who also contributed three of the scripts. NBC asked Cooper to write the script for the premiere, "First Person Singular", which is told entirely from the point-of-view of an unseen murderer who kills his obnoxious wife and winds up being executed. Variety gave this first episode a rave review ("undoubtedly one of the best dramatic shows yet seen on a television screen"), but Lights Out did not become a regular NBC TV series until 1949. Coe initially produced this second series but, for much of its run, the live 1949-1952 Lights Out TV series was sponsored by Admiral (makers of television sets and refrigerators), produced by Herbert Bayard Swope, Jr., directed by Laurence Schwab, Jr., and hosted by Frank Gallop. Critical response was mixed but the program was successful for several seasons (sometimes appearing in the weekly lists of the ten most watched network shows) until competition from the massively popular sitcom I Love Lucy helped to kill it off. The 1949-1952 series featured 'Dead Man's Coat,' an episode starring Basil Rathbone, adapted from the radio script 'Wear the Dead Man's Coat' from the program 'Quiet, Please.' Arch Oboler's 'And Adam Begot' was also adapted from the radio script for the television series, with Kent Smith in the lead.